I will attempt to grow Padron peppers in a container. Yield should be in 45 days. One of the great Spanish Tapas is Padron Peppers or Pimientos de Padron. When one travels to Spain, Pimientos de Padron will commonly be found on any good Tapas menu. In California, especially the wine country scene, Padron peppers are becoming very popular on restaurant appetizer menus. Most of the restaurants that serve Padron peppers grow them in their vegetable gardens. Padron peppers need full sun and warm temperatures. They can be grown in the ground, spaced about 24 inches apart, or in containers. In the photo above, I planted one Padron pepper in a pulp container. Since I do not have a full sun spot in my yard, I have the container on wheels. I will move it to the sunny locations of my yard. According to the tag on the Pardon pepper plant, it will yield peppers in 45 days. I will report back in 45 days or sooner perhaps to give you an update of my Padron pepper progress. 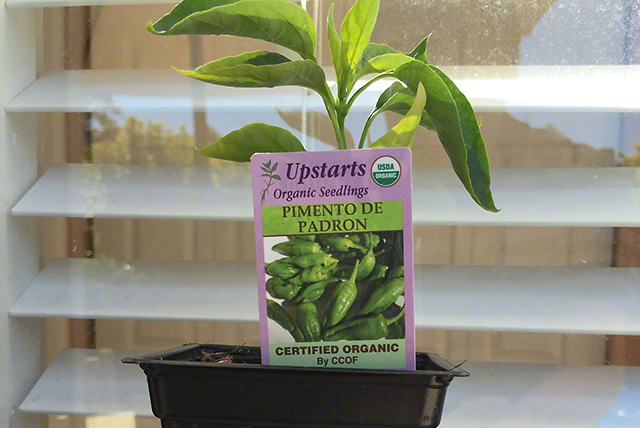 I purchased the Padron pepper at the Golden Nursery in San Mateo, California. Once the Padron Peppers are ready, you can cook them up in various ways. The most common way is to fry them quickly in olive oil and then douse them with some coarse salt. I encourage you to grow Padron peppers for a fantastic appetizer. Best wine to have with Padrons is, without a doubt, the lovely and crisp Albariño wine.